Available for the cheaper cost. They can stay longer in air. The Syma is the leading company which designs for toy drones. Among them, Syma Quadcopter X5C Explorer Drone is the best model. This drone has some advanced features. As this is a toy drone, children can easily catch hold of it and enjoy themselves for hovering UAV. There is nothing special about Syma X5C, but it works and cheap. We cannot expect for an amazing aerial video and pictures. Syma X5C Quadcopter Drone is the best toy drone. Syma is one of the large-scale enterprise located in China. The company has its designing team, manufacturing team, and trading team. They have advanced equipment for scientific research, production, and testing. Currently, they have spacious standardized workshops, dormitories, and modern offices. Highly qualified technical and managing team help them for their excellence. Syma products are sold very well at worldwide. “Technological Innovation & People First” is the companies theme. The organization continue to grow and strive to produce original and innovative engineered products. The camera resolution is 1280 x 720 with a high picture quality. This product can be used both in indoor and outdoor. It is not a problem if it just falls from a rooftop. As the wireless range capacity is 50m it can go to some far distances. Batteries are to be installed to control the drone, and company kit gives us extra batteries. This UAV can move upwards, downwards, forward and backward by the particular feature 360-degree eversion. This feature is in Syma X5C explorer drone. A gyro is an electrical device which uses vibration sensors that sense angular velocity. The introduction of 6 axis gyros in drones made them more stable. Six-axis is the combination of six sensors that can detect unexpected attitude and fall. 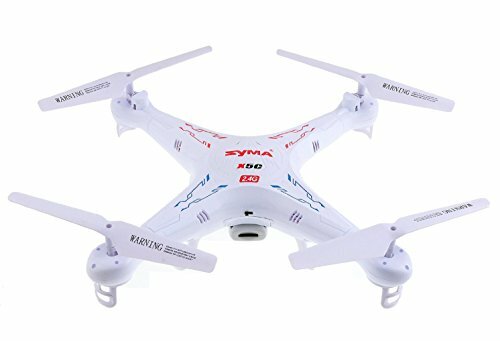 Syma X5C Quadcopter has an additional feature, i.e., eversion. Eversion is the process of turning inside-out. This Syma X5C toy quadcopter rolls continuously in 360o for perfect action and incredible performance. X5C has a great feature, i.e., with HD cameras. We can enjoy taking videos and pictures. The company includes a 2GB Micro SD card. Resolution of images is 1280 x 720. Video capability of this drone is 30 frames per second. The camera quality may be not the best compared to others. This model is equipped with a colorful flashing light so that our aircraft visible at night times. Hence we can experience of flying off our drone. Charging time of the drone is about 100 minutes and flying time is about 7 minutes. Battery capacity is of 3.7V. Syma X5C has 2.4GHZ frequency and bandwidth. Spread Spectrum technology is used for far distances and is capable of anti-interference ability. Reaction speed is 100 times faster than other radio control. The company is trying to provide the best service and reliable products compared to others. Defective products replaced by new goods and buyers pay return cost, and company will pay for resending. If you have any queries, contact the manufacturer because the company does not want to disappoint the customers. The warranty of the product is one month. In this Syma Quadcopter X5C Drone is to install landing skids and blade protecting frame. The installation requires only two steps. To every corner mount the blade protecting frame. This drone can fly upto higher distances. the camera of Syma X5C has 720 pixels. The range of X5C is 50m distance. This drone can fly in both indoors and outdoors. It is a cheaper drone. X5C Quadcopter has a less flight time. Charging time of this UAV is more. Take care before charging the battery and use only Original USB cable. If the drone bottom surface is hot, do not charge. We should not often charge or discharge the battery. A person should be 13 years of age or older. One should register if drone weights more than 0.55 pounds and less than 55 lbs. Label your UAS with your registration number. Physical address and mailing address. I am providing you with extra information about Syma Quadcopter Drone regarding through other customer reviews. Hence we can find out additional details about the product so that we can know the other benefits and flaws in the product. I purchased on Amazon but… this is a fantastic value. Fun and easy to fly. I started with a toy from Radio Shack, and this is much easier. After trying indoors outdoors is amazingly easy to do basic maneuvering. I have attached a photo (that I only straightened and slightly cropped) to see for yourself. I decided that I could not justify the $1000+ to have something to lift a Go-Pro, so this will suit me fine for quite some time. I have plenty more experience to gain doing advanced stunts but I wanted this to take photos from a different perspective, and it fits the bill just fine. Happy flying! This product is better than other products I have tried. I’m jubilant with this drone! I started with a Cheerson CX-10 and then bought three more of those for my family, and I then upgraded to a Parrot AR 2.0. I have mixed feelings about the AR. Not too long after getting the AR, I saw this inexpensive drone and, based on positive reviews, decided to give it a try. Syma X5C is the best product than others and is now my favorite BY FAR! It’s very straightforward and light than others. It’s easy to fly and takes crashes very well. The batteries are cheap. The multi-battery chargers are available so you can fly just about as long as you can stand it. The camera is so-so but, come on; this is a super cheap drone. I suggest this product to beginner’s so that they can understand and operate well. Besides its flaws, it is an awesome product we can enjoy the pleasure in flying our drone. This product can also capture photos and videos. Can fly at both indoor and outdoor. Syma X5C is the cheaper product and durable product which I prefer to you. What's the actual video resolution? 1280 x 720 pixels (720p) at 30 frames per second and a data rate of 1.5MBps – In other words while this is technically an HD format, it is of a very low quality. Do I need to register this drone under UAS registration? No, the X5C only weighs 107grams and does not fall within the UAS guidelines of .55lbs (250g) to 50lbs. Around 6 minutes flight time. It takes 25 minutes to charge the battery. What types are batteries are needed? Controller takes 4 AA Batteries and that’s it. Quadcopter comes with a chargeable battery but I would recommend buying an extra or more due to short flight times. Great quad for a starter.